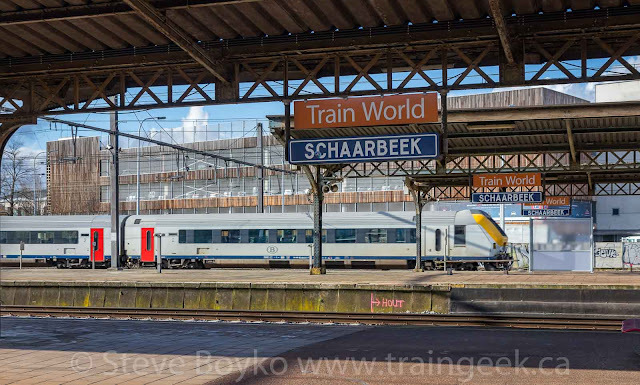 After I visited Train World in Brussels, I walked to the adjacent Schaerbeek train station to catch a train back to the central train station. My luggage was in a locker in the Centraal station, so I had to get that first before proceeding on to Aalter, my final destination. There are a lot of trains passing through the Schaerbeek station. 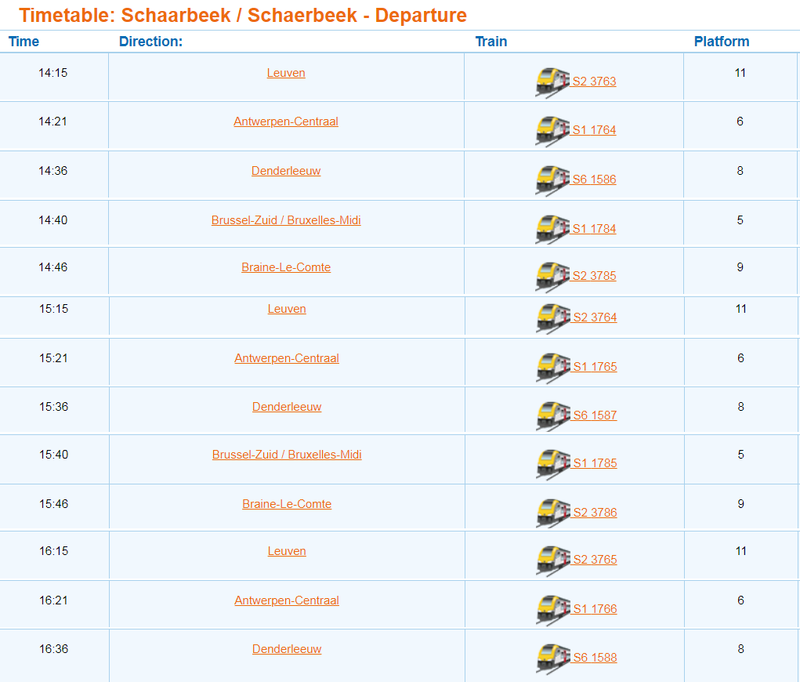 This is a snapshot of a bit over 2 hours for a Sunday afternoon at Schaerbeek. These are just the trains that stop at Schaerbeek. 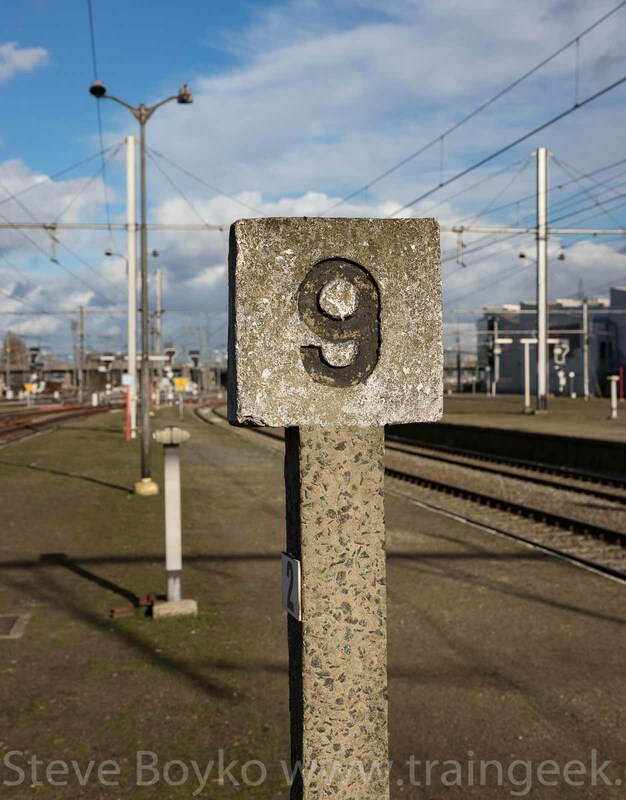 I'd say the same number passed through the station without stopping when I was there. I just missed the train I intended to take, so I had to wait a bit. It turned out that I waited for almost an hour. 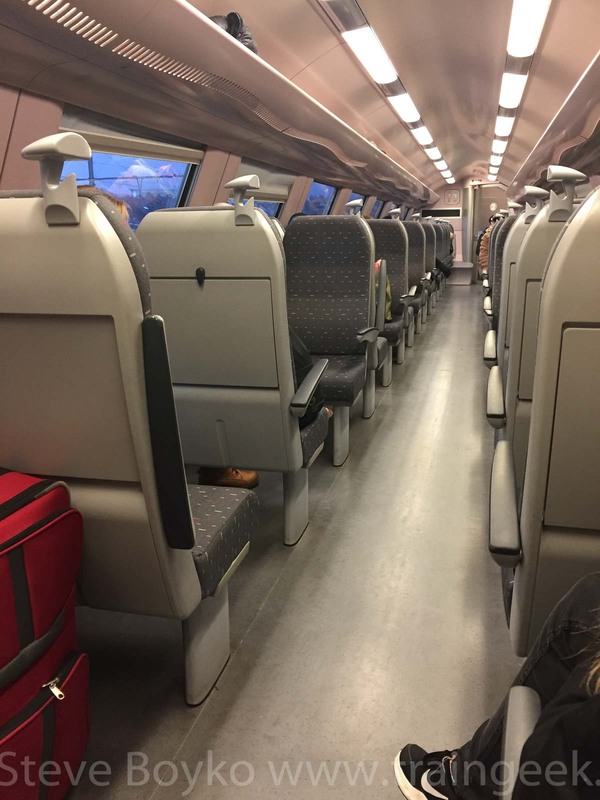 In retrospect, I certainly could have left earlier, had I known more about Belgian train schedules. Trains going to Antwerp, for example, also stop in the central station along the way, and I could have taken one of those. All I had to go by was the video display and paper schedule posted in the tunnel under the tracks, and that showed the next train stopping in Centraal was in about 50 minutes. Fortunately, it wasn't cold, and I wasn't in a hurry, so I was happy to wait on the platform and photograph trains as they went by. I'm going to share some of the photos I took in that hour of waiting. I'm not sharing every train, but just the ones I found the most interesting. Also, these aren't in order of appearance. 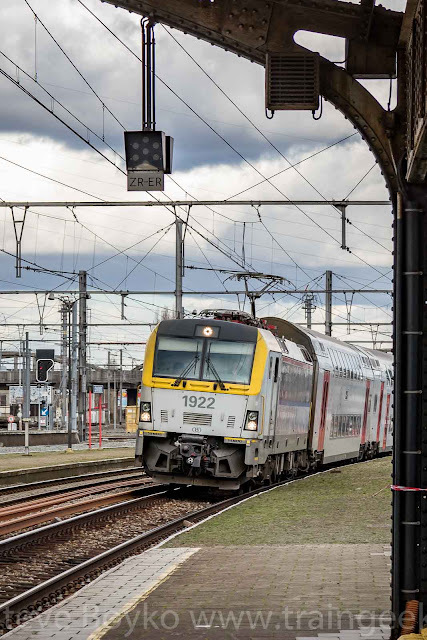 This is a Siemens class 18 (EuroSprinter ES60U3) locomotive pulling a "double-decker" train on a passing track. 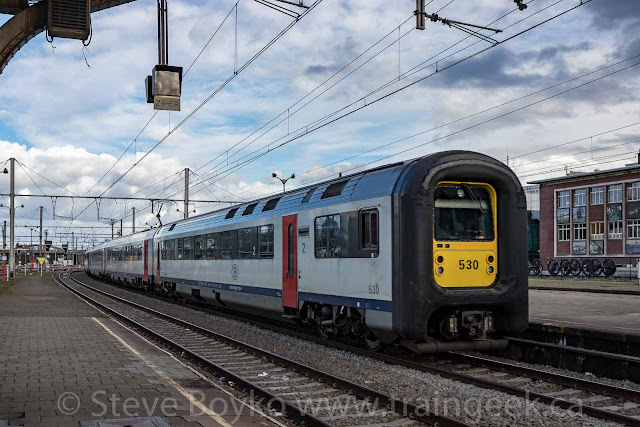 SNCB, the Belgian train operator, purchased 120 of these electric locomotives starting in 2008. I saw quite a few of them when I was in Belgium. In fact, I saw at least 3 while I was waiting for my train! 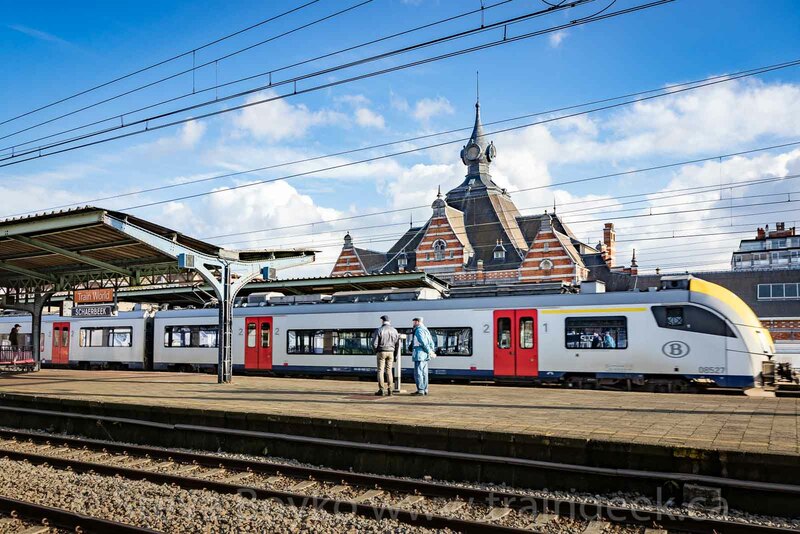 These Siemens Desiro ML trainsets are all over the place in Belgium. I photographed quite a few of them. I was glad the sun came out for a little while so I could capture this image of the train in front of the old station. I especially like the two old gentlemen standing on the platform. You can see I was standing on platform 9 waiting for my train. 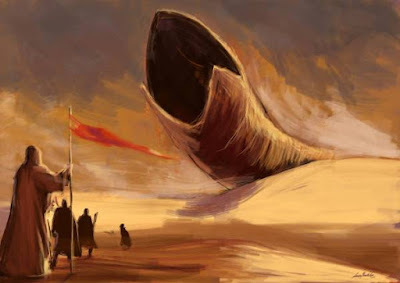 Wonder why it's called a "pig nose"? The above train is an MR-75 / AM75 electric multiple unit (EMU) train. 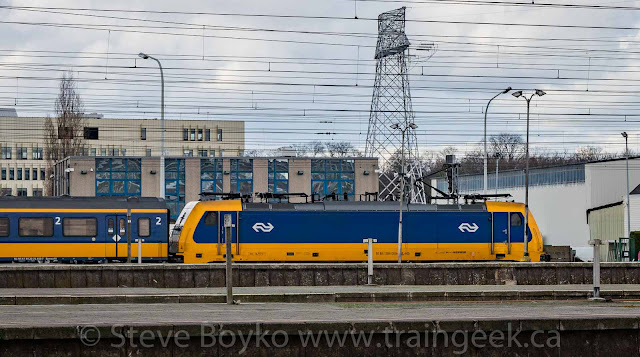 There are 44 of these trainsets, built between 1975 and 1979. Refurbishment started on these in 2015 and should be complete by 2020, extending their life by another 15 to 20 years. They are called "pig nose" trains for fairly obvious reasons. One more domestic train before we move on to the international trains I saw at Schaerbeek. Not sure what kind this is! This Thalys trainset also did not stop at Schaerbeek. Thalys is an intercity train serving Germany, France, Belgium and the Netherlands. I've always liked the look of their trains. 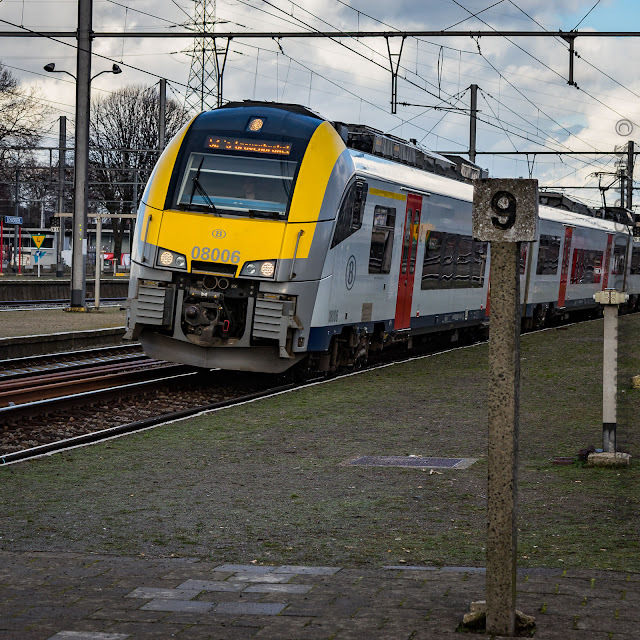 The above train bears the logo of the Nederlandse Spoorwegen, aka the Dutch national railway (Dutch is a great language). The blue and yellow is a classy look, in my opinion. 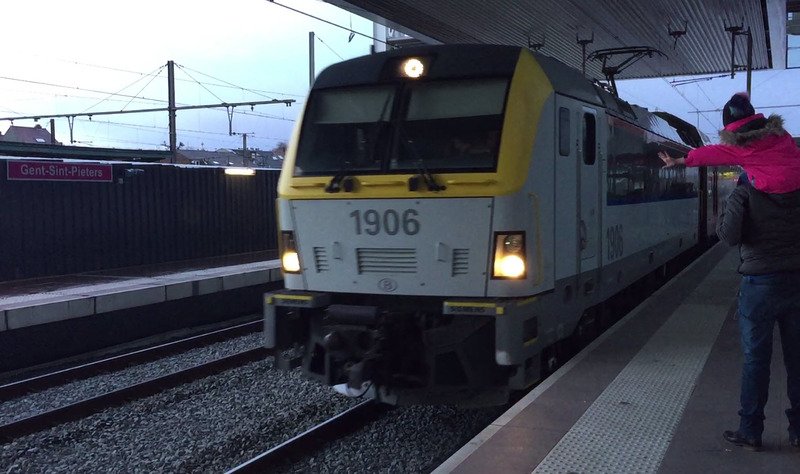 There was a class 186 locomotive on either end of this train. 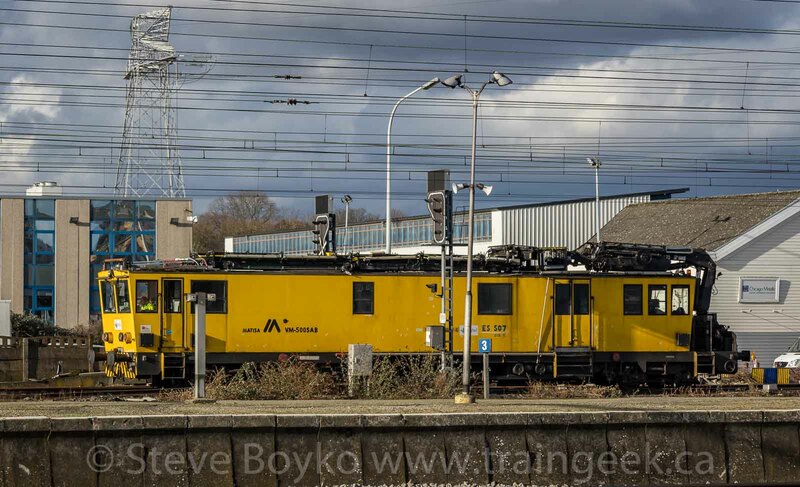 These Bombardier TRAXX F140 MS locomotives push/pull the international trains between Amsterdam and Antwerp. 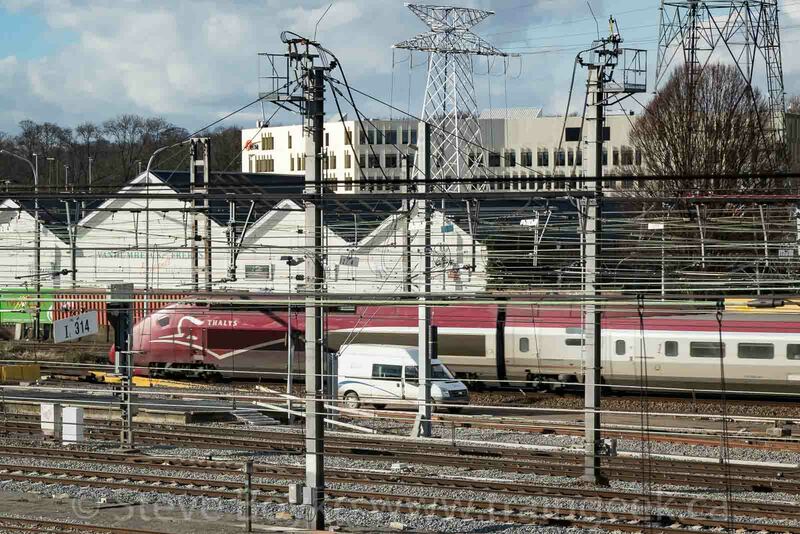 They operate on the HSL-Zuid high speed rail line but these locomotives are only capable of 160 km/hr, so they take a back seat to the much faster Thalys trains. 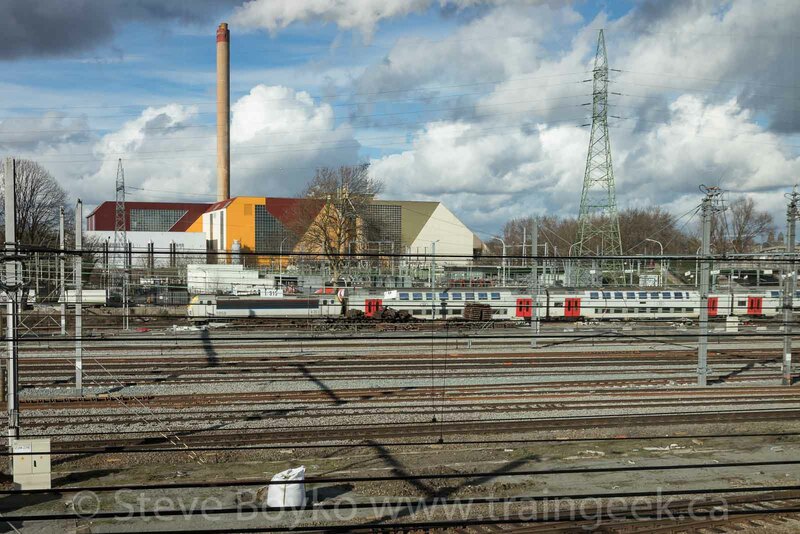 I was pleased to catch a German Intercity-Express (ICE) train going through Schaerbeek. 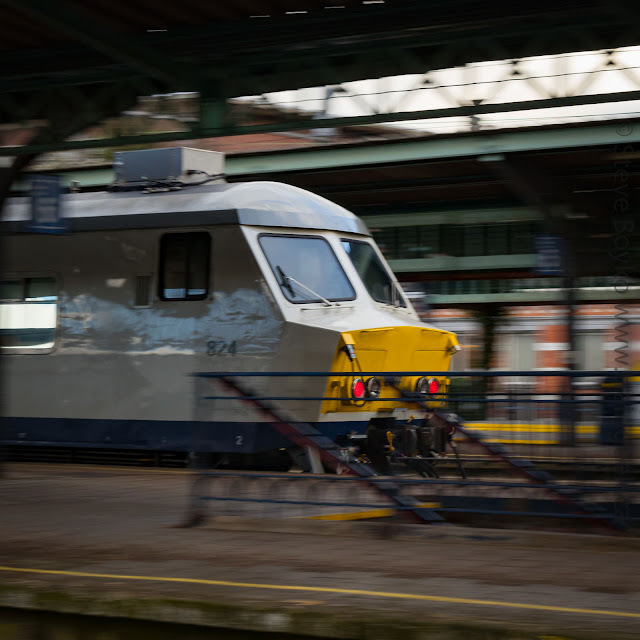 I believe this is an ICE 3 trainset - a Siemens Verlaro - capable of 320 km/hr speeds. It certainly wasn't going that fast through here! Spoorworken. What a great language! The above vehicle is a Plasser and Theurer tamper - specifically a Unimat 08-275 3S. Tampers pack (tamp) the ballast under railway ties to make the track more durable. Check the link for a video showing the tamper in action. 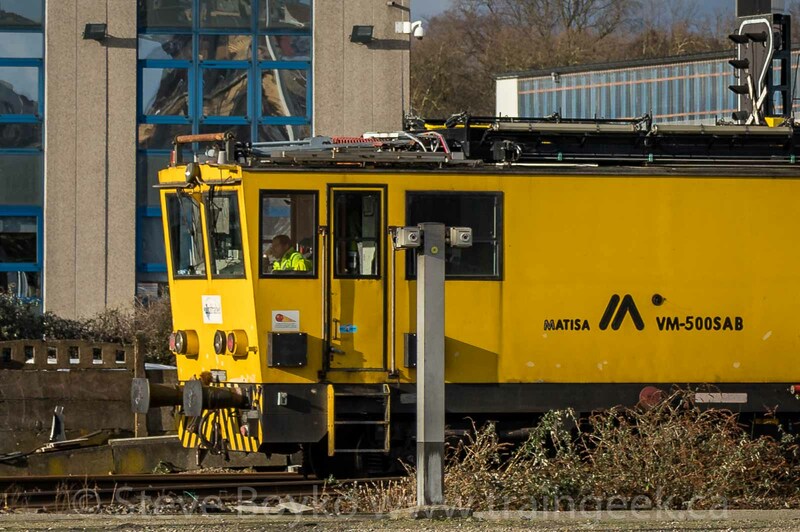 "Spoorworken" means "railway work" and Vanormelingen-Stas is an equipment rental company. This vehicle is a Matisa VM500 SAB. As far as I can tell, it has platforms on the roof that can be raised for working on overhead electric wiring. Eventually my train came and I took it to the Centraal station, fetched my luggage, then got on the train to Aalter. 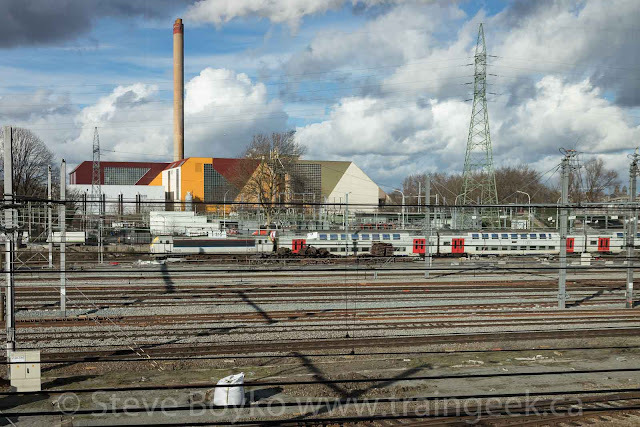 I had to switch trains in Ghent (known as Gent-Sint-Peters station) so I took a few photos from the platform there while I waited. You'll see more photos from that station in another post. 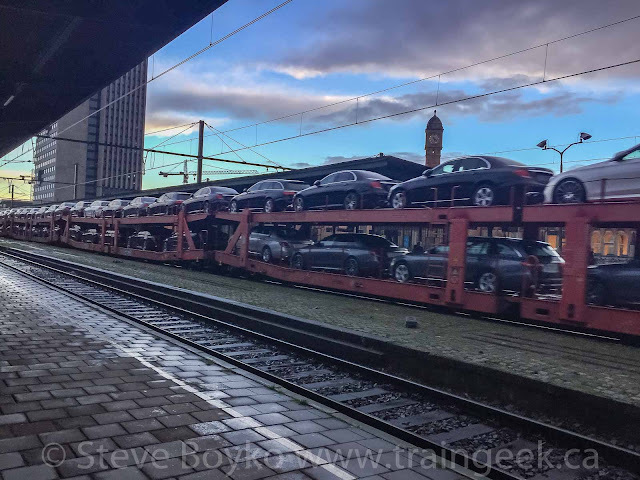 I find it very interesting that European trains still have cars and trucks in open autoracks. In North America almost all road vehicles are shipped in enclosed autoracks to protect them from theft and vandalism. Clearly that's not as much of a problem in Europe. In fact, as you can see, they are shipped without any covering at all, not even the vinyl coverings over the headlights and other vulnerable bits that you see in North America. Another Desiro ML trainset came rolling through Ghent while I was waiting. No children were harmed in the making of that video. By the time I got to Aalter, it was dark and my railfanning was done for the day. 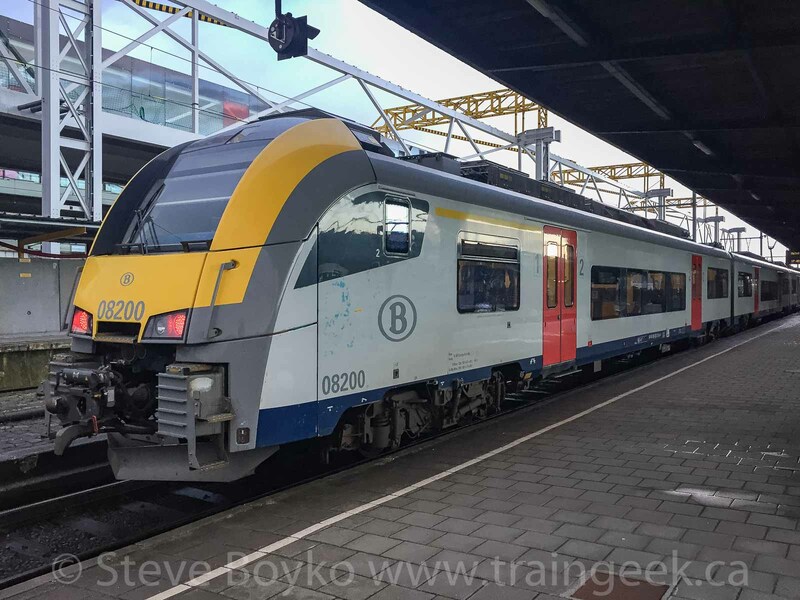 It was a great day to see trains, and Belgium is indeed a railfan's delight. So many trains, and all different from what I normally see in North America! I think there will be two more posts in this series - one featuring trains at night and the other featuring trains spotted at Aalter, Brussels and Bruges. More to come!